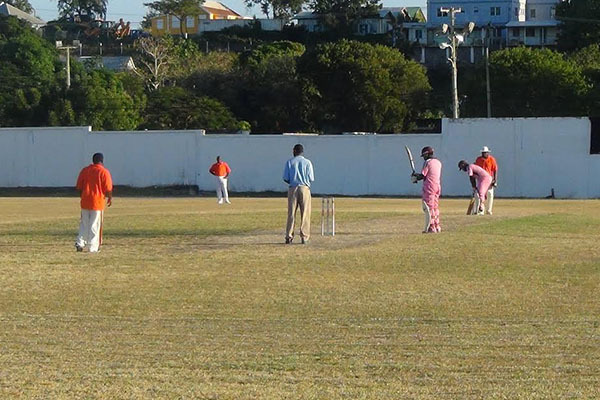 The Nevis team look alike Four Seasons team, sporting their brand new pink coloured outfits, plundered the Easterns bowling at the ET Willet Park on Thursday 13th March. This as the action in the local second division competition continued. The Four Seasons team which comprises of quite a number of Nevis senior team players such as Javia Liburd; Nelson Boland; Andre Browne; Denison Browne; Kejel Tyson, among others, batted first and maximized on the Easterns off course bowling and wretched fielding to be at 195 before the first wicket fell. That’s when Javia Liburd was bowled by the experienced Alsted Pemberton who inexplicably was introduced late into the attack. Kejel Tyson then holed out on the long on boundary off the bowling of debutant Vacario Hendrickson. The catcher was Samuel Williams, who in the previous over, off the same bowler, had dropped three catches which could have seen the two openers already back in the pavilion. The other opening batsman, Xavier Cornelius struck the first century of the season, eventually 112 not out. Interestingly, veteran Masters’ player, Clinton Swanston, volunteered to sit on the bench so that his son could be included in the eleven but to his dismay, was not even given a bowl. Four Seasons chalked up an imposing 212 for 2 in just 20 overs. A totally demoralized Easterns team could only muster 90 all out off the final delivery of the 20th over, in return. Alsted Pemberton got 16; Sydney Newton 15 and Mervin Hendrickson 10. Kejel Tyson bagged 4 wickets; Swanston 4 and Javia Liburd 1. Four Seasons won comprehensively by 122 runs. Meanwhile, in the other match played on that same day, the Charlestown Secondary School team, easily disposed of their counterparts at the Gingerland Secondary School, at the Gingerland Recreation grounds. GSS batted first and were bowled out for a meagre 58 runs which the CSS team knocked off in short order, with only the loss of Ross Powell’s wicket.